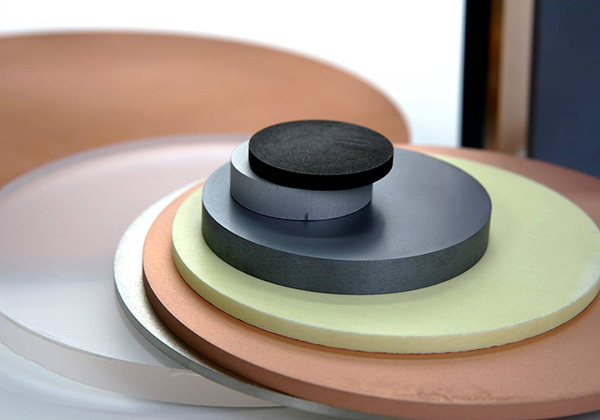 A wide selection of compound based sputtering targets: oxides, nitrides, borides, sulfides, selenides, tellurides, carbides, crystalline and composite mixtures. Testbourne compound target production methods include vacuum hot pressing, hot isostatic pressing, cold isostatic pressing, and cold press sintering. Depending on the required material targets can be manufactured from 1 inch up to 20 inches in diameter, rectangular targets are available from small to over 1000mm lengths in single or multi sections. To achieve the best performance and to prevent the target from cracking or over-heating, we strongly recommend bonding any material target to a backing plate. Please visit our Bonding Service Page for more information. Borides are generally used for wear-resistant films, Titanium boride and zirconium boride films increase life time of cutting tools. Lanthanum boride coatings are thermionic conductors. If you require non-standard size product, please Click Here for our custom product enquiry form.